They’ve become my new summer veggie. With a lotta fresh n’ chunky tomato sauce. And it only takes a few mere minutes to prepare. It’s perfect for my pre-dinner appetizer. Instead of that summer salad, why not try a bowl of leeks to spruce up the excitement in your kitchen? Perfect for me and my clean eating. Now that my stomach is starting to heal and I am starting to feel better, I’m keeping my meals simple and fresh. Suprisingly, I seem to feel a heck of a lot better. Now, I’ve never been one for processed, packaged foods but every now and then I’d have some Dijon or Trader Joe’s salsa, but I’m finding that my body is not likin’ sulfates and anything that is pre-packaged…even if it’s healthy. I seem to feel better. So I’m stickin’ with my pure, clean n’ simple foods. Keepin’ it simple n’ naturally sweet. And I’m feeling good about myself and my food. I can sum it up in one word: Luscious. The word just sounds good, doesn’t it? This is the perfect side dish or appetizer for a summer’s eve. 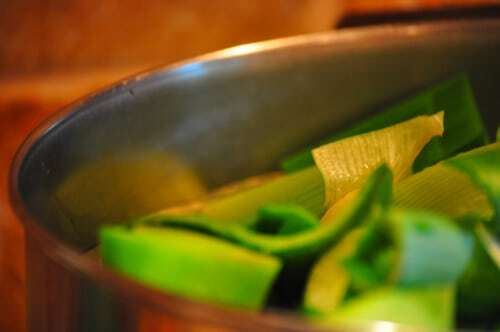 In a large pot over medium heat, steam leeks for 7-10 minutes or until soft. 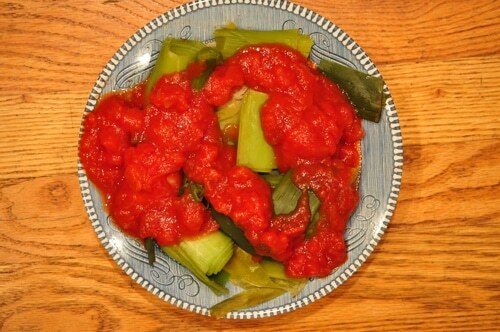 In a food processor, combine tomatoes, coconut oil, lime and orange juice; process until smooth. Remove from heat; transfer to a serving bowl. 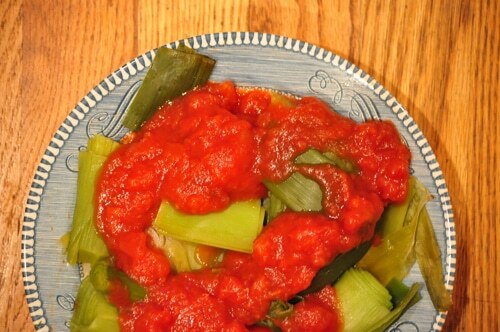 Serve leeks warm or at room temperature with fresh tomato sauce mixture. 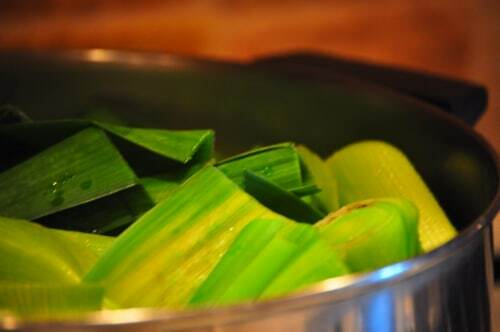 Have you ever tried making leeks? How do you prepare them? Check out this interesting cheese company right across the bridge in Brooklyn, which makes amazing vegan homemade cheeses. This looks so amazing. But then I *hate* myself – because it’s never enough..I still have to stuff myself with cookies or chocolate later…I don’t know anymore. So proud of you Amie! Thanks so much; I appreciate all of your support. I hope you have a chance to make these leeks. 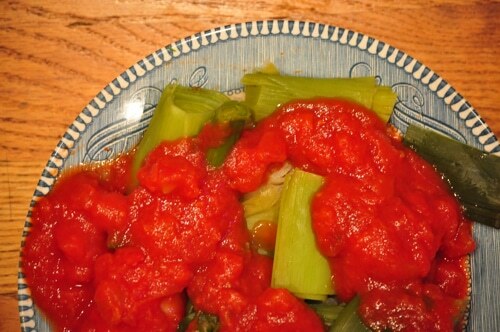 Yes, I prepare the sauce myself … it’ simply just chopped tomatoes! Enjoy and have a great Sunday. I’m glad you’re feeling better! I definitely don’t eat “clean” all the time, but I DO feel better when I’m loading up on fruits and veggies and not processed food! I haven’t been eating any leeks this summer but I want to try this! Thank you, Liz; you are so kind! It’s so great to hear from you. I hope you have a chance to try some leeks this summer. 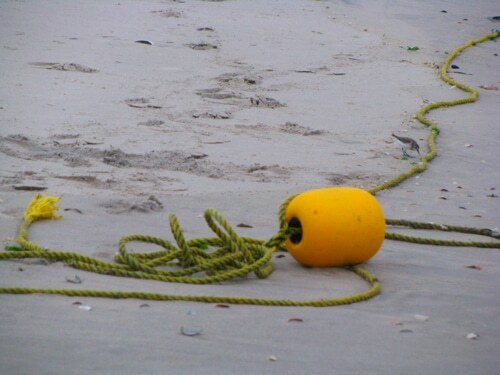 Enjoy and have a great weekend! 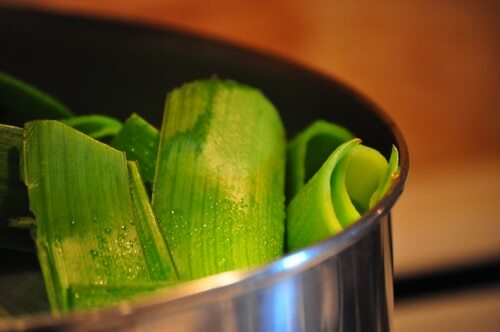 Mmm… I love leeks. My favorite preparation is to thinly slice the white and light green parts, then slowly cook them in a skillet with a little butter and salt until they are slightly brown and caramel-ly. Then I eat them as a side dish, mix them in quiche, serve them over fish – so many possibilities! 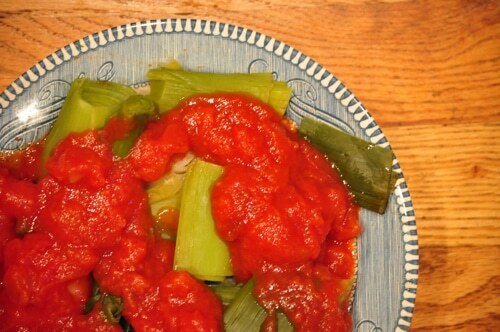 Great to hear from you; this sounds delish…thank you for sharing…I’m loving leeks and I have fresh ones in my fridge right now…can’t wait to get creative with them. Have a wonderful night and thanks again for your comment! 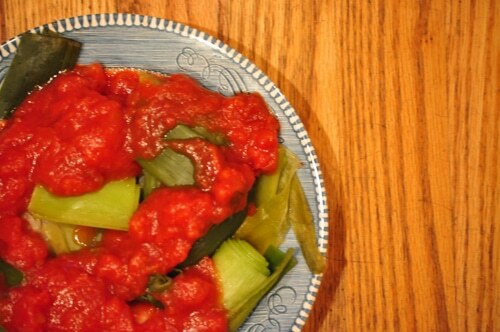 thanks for this leek recipe, looks delicious! 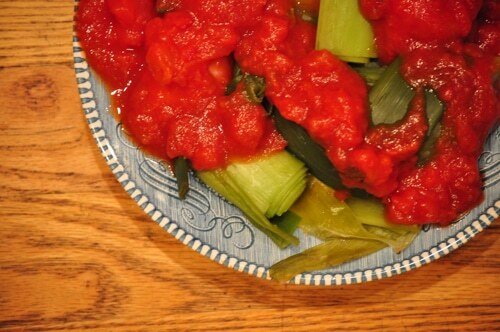 i’m definitely going to try making it one day, seems hearty enough with the tomato sauce to be a warming winter dish. i just bought 2 leeks and i chopped them finely and baked them in a square dish in the oven with some vegetable stock, a tbsp of vermouth, 2 cloves of garlic, fresh lemon juice, and ground black pepper, and they turned out delicious! the vermouth adds a really nice flavour, though i’m sure you could leave it out and these would taste just as good. i ate them as a side dish, and then later incorporated the leftovers into other dishes as an onion replacement, it adds so much flavour without the strong onion flavour/bite. Also, i know coconut oil is best for cooking, though I’m confused which one is the healthier one to buy, seems like there are a few differences between the ones I see in the grocery store and I’m not sure which one is the right one? Thank you, Mandy; so great to hear from you. 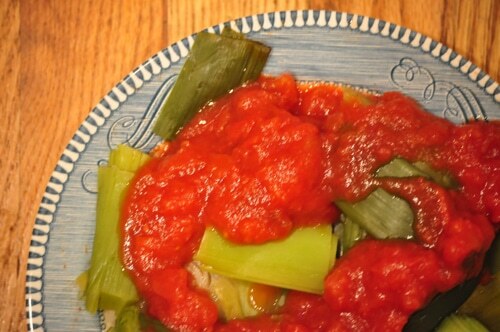 I love leeks and I’ve been using them in my weekly meals. 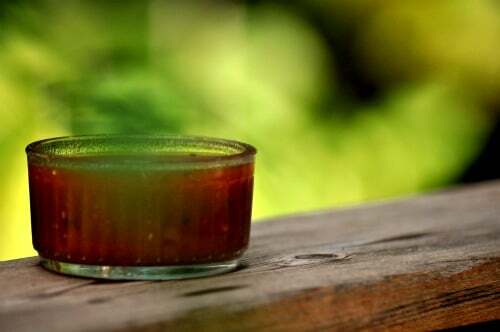 I like using coconut oil as it’s what helped to heal my gut when I was dealing with lots of stomach problems, also it’s got a wonderfully natural sweet taste and I enjoy it over olive oil. Enjoy this recipe; have a wonderful weekend!